We were supposed to have a small family engagement dinner on Saturday night at La Sirena Clandestina here in Chicago. Right as we were about to leave, Tony started yelling my name from the kitchen. I walked in and realized he had cut his hand pretty badly trying to open a package with a knife. Oops. Twenty minutes later we were in the ER and he ended up with six stitches. No bueno. 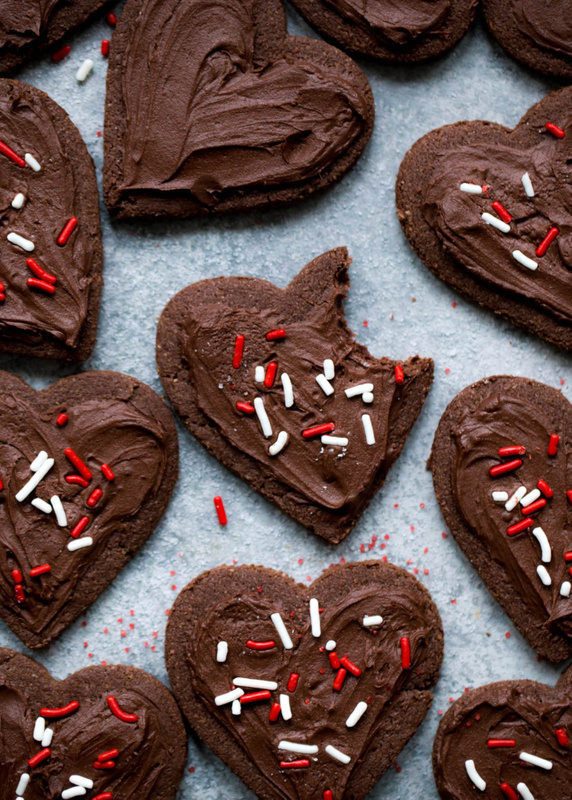 On the upside, we had a fabulous breakfast on Sunday and ended the day on a sweet note with these amazing grain free chocolate cut out cookies. Not gonna lie, I had two with extra sprinkles. These chocolate sugar cookies are a take on my almond flour sugar cookies, which are most definitely in my top 5 favorite cookies of all time. Seriously, UNREAL. If you haven’t made them yet, prepare for a life changer. This time I’m showing you how to make them into adorable sugar cookie cut outs. 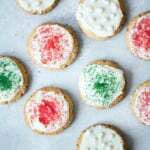 Yep that’s right, these cookies can either be rolled into balls and baked or made into adorable sugar cookie cutouts, frosted and decorated. Perfect for making with kids, bringing to parties or birthdays, or just enjoying them at home. Or of course, Valentine’s Day. 1.) 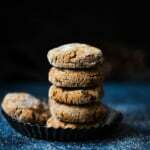 Almond Flour cannot be replaced with any other flour, nor should you attempt to replace the coconut flour. The cookies really are perfect as is, promise. 2.) 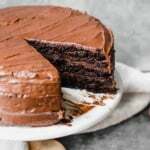 This recipe is grain free, gluten free and easily dairy free (just use vegan butter instead of regular butter in the frosting). 3.) You need to make these as soon as possible. Hope you love them as much as we do. If you make these be sure to tag #ambitiouskitchen on Instagram! xo! Grain Free Almond Flour Chocolate Sugar Cookies -- this easy one bowl cookie recipe can be made into cut out shapes or rolled into dough balls! 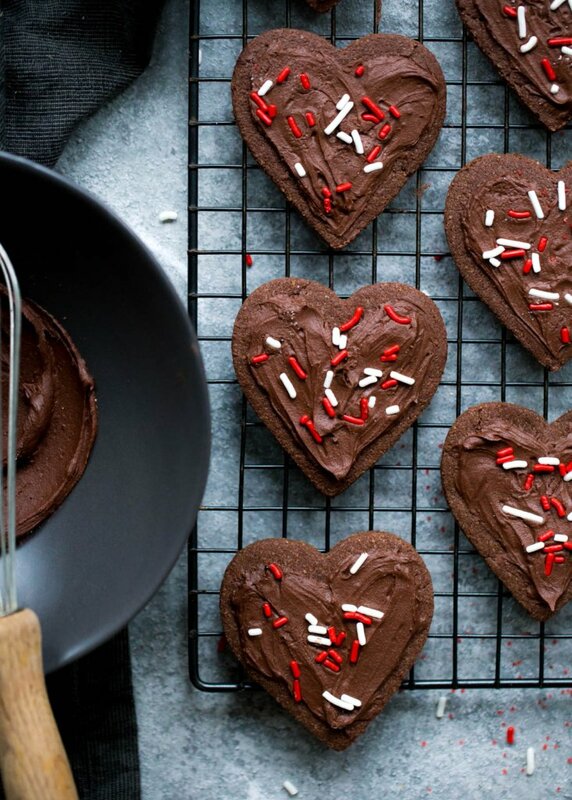 Topped with a silky velvet chocolate frosting. In the bowl of a food processor, add in coconut oil, sugar, honey, egg and vanilla extract. Process for 20-30 seconds until well combined. Next add in almond flour, coconut flour, cocoa powder, baking soda and salt. Process until a dough forms. Allow dough to sit for 5 minutes. You can also mix by hand or use an electric mixer, but I find the food processor to be the easiest! Preheat oven to 350 degrees F. After 1 hour, remove the top of parchment paper then use heart cut outs (or whatever kind of cutouts you like) to cut out cookie dough. Place cutouts on a cookie sheet lined with parchment paper and bake for 8-10 minutes. Remove from oven, transfer to a wire rack and allow cookies to cool completely before frosting. Makes about 15 cookies. Tip: Keep the dough scraps and make small cookies if you'd like! To make these dairy free: Use vegan butter instead of regular butter. Both almond flour and almond meal should work for this recipe, the texture just might be a little different. Melted and cooled butter will work in place of the coconut oil. Weekend Favorites: A little vacation on the horizon Ambitious Home: My New Mattress! 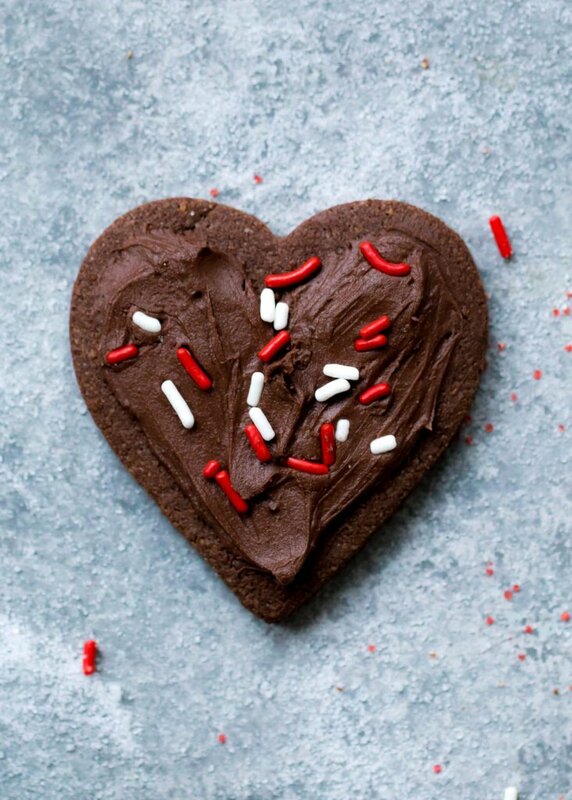 40 Responses to "Almond Flour Chocolate Sugar Cookies with Velvet Chocolate Frosting"
Convinced I need these AND your almond flour sugar cookies in my life. Glad to hear you guys still got to celebrate despite the scary slip! Hi. 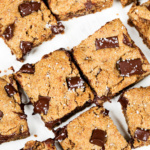 Can almond meal be substituted? Thanks. Looking forward to trying. Hi Andrea – I wouldn’t recommend almond meal as it will change the texture. 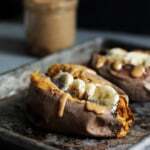 I’m making these right now and they look delish! A few questions…what is the health benefit of almond flour? And what is the difference between almond flour & meal? A lot of the bags at the store said “almond flour/meal”.. thanks!! 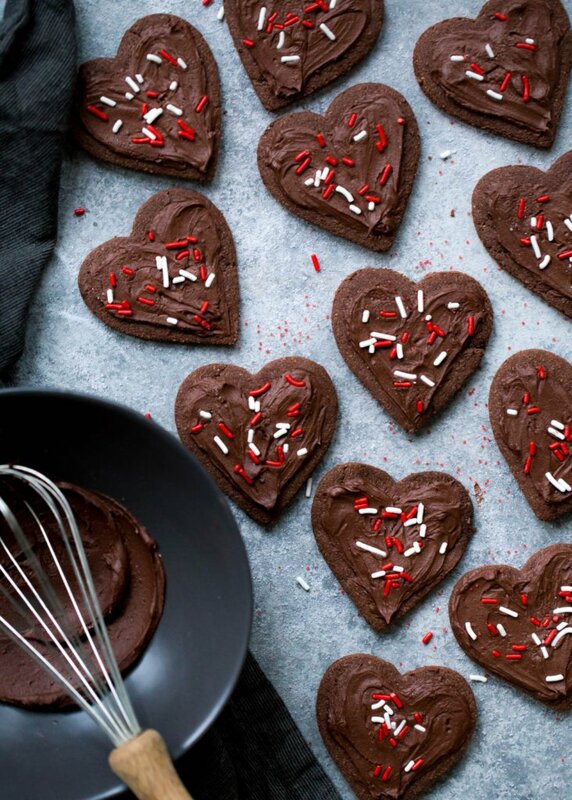 These definitely need to be on my Valentine’s Day treats lineup! great recipe! Kid and hubby approved! Did you fridge them after frosting ? Thank you for the good recipe!! Do you think it would turn out if put a caramel in the middle of the rolled ball, like your salted Caramel snickerdoodles? 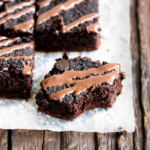 Just made these without the frosting for a quick treat and they were great! I cut the entire recipe in half, rolled into balls and flattened with a fork similar to peanut butter cookies. 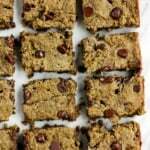 Next time might try adding coconut, chopped nuts or chocolate chips to them as well! Thank you! Amazing! I’m so glad you enjoyed these. Those add-ins sound delicious, too! i have these baked and cooling! 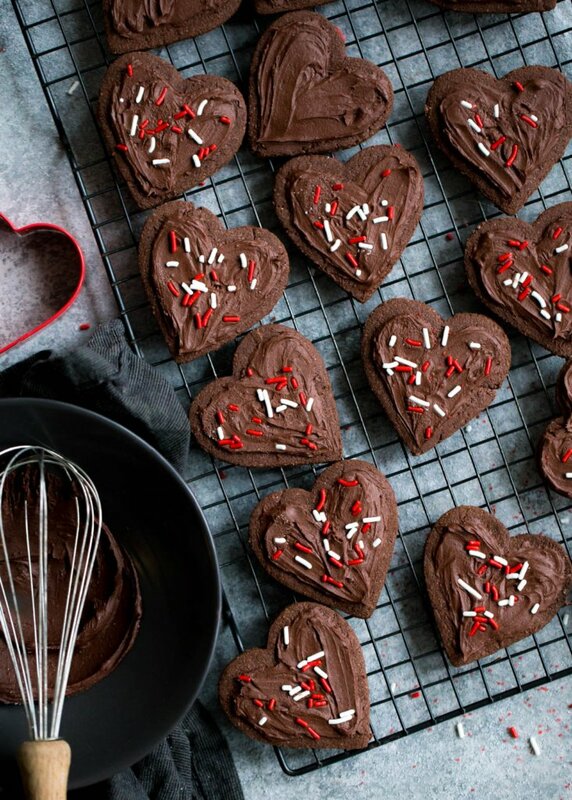 can’t wait to frost and decorate for valentines day! is it ok if i make a post on my blog and link back to you? Did you find a replacement? I have the same question. You could try oat flour, but please know that I haven’t tried it. I made these last night. The dough seemed very crumbly and dry, so I added a dollop of sour cream to help pull it together and I got lovely, chewy, soft cookies. Happy to hear that everyone loved them! I’m not sure why the dough ended up being crumbly or dry, but glad the dollop of sour cream helped out. I made these last week and they truly are delicious! This is a recipe I will keep around. I love doing double batches and then freezing them so they’re available later! I seldom bake with white refined flour and so I am always looking for goodies with alternative flour’s like almond or oat or coconut, etc. Thanks! I want to make these for my daughter’s class party because they look amazing! However, they have to be nut free. Any suggestions as a decent sub? Or should I fold and find another cookie recipe? Help! Thanks so much.